How do you achieve record sales when there’s almost nothing to buy? 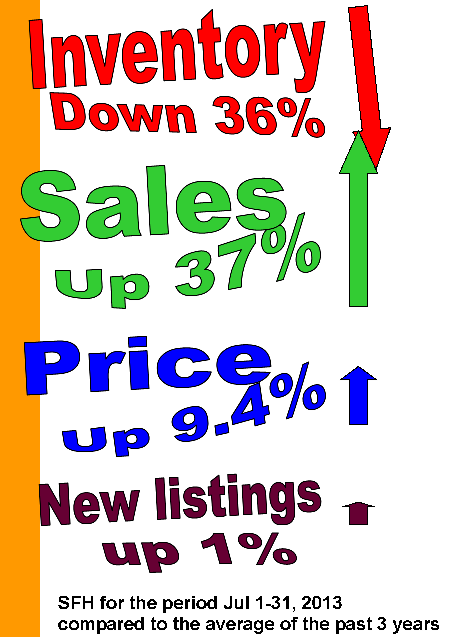 Inventory is at its lowest point since 2006, so you know that attractive new listings are going fast. As we learned from the craziness of 2006 – 2007, a runaway market is no fun for anyone except a few sellers who are moving to cities where the prices are low or dropping. Many homes are sold by the time a buyer comes to view them. Sellers can realize a quick sale, but if they are moving up or across town, they have all the headaches of looking for a new home with all the difficulties and turmoil of an over-heated market. We require lots more inventory before things will settle down, and there is no sign of that happening. First-time buyers were up 39% compared to the average of the past 3 years. The sales-to-new-listings ratio at 80% is the highest it’s been since 2005. Homes under $500,000 are in huge demand, with an absorption rate of 1.1 in July. That is an entrenched seller’s market. Over the last four days of July, 15% of sales were for list price or higher. As Brad stated in his recent comment, Garth Turner looks very foolish for his dire predictions of a nosedive in Calgary’s sales. Be careful who you listen to. This entry was posted in Calgary SFH, City of Calgary, First-time buyers, Market update, Month-end. Bookmark the permalink. Why is inventory so low? I understand the flooding has not helped inventory but inventory seems to be low for a while now (even before the flooding). It doesn’t make sense to me that it should be so low. I also understand builders can say that they don’t have enough land to build on but I would suspect there would be a lot of houses that are not new that could be in the market. I also can see new people coming into the city being an issue, but Calgary usually has always had migration every year (lets say in the last 6-10 years). I read your blog for a dose of reality about Calgary real estate. Kudos to you Bob for standing your ground and giving us the truth. Garth Turder finally admits he got it all wrong about Calgary on his blog posting for today. If anyone followed his advice for the past five years, they’ve screwed themselves out of a house when it was affordable(and when there were still houses for sale!). Wishing for lower prices won’t make it happen. Garth Turder will be eating crow again it seems. Toronto Real Estate Board stats for July are out today: Sales up 16% and prices up 8% year over year. Ouch! One thing that will help the Canadian real estate market is falling interest rates. It looks as though interest rate increases in America are over and the question still remains can America escape recession in 2014? One thing i disagree with Garth on is over interest rates. I see interest rates falling for the next several years then flat lining for at least the next decade here, in America and in most countries around the world. But Fernando, house prices in Calgary are essentially flat for the past 5-6 years and one can actually get a better deal on a mortgage now. So although I didn’t know who Garth turner was 5 years ago, I am nevertheless glad that I didn’t purchase right after I graduated university in ’07 and I definitely don’t feel as though I’ve screwed myself. On the other hand many my peers that did take the plunge were in a very bad place financially precisely because they bought in those years. Now that I am looking to buy, I am in a much stronger position with a lot more options even in this tight market. Is Garth good at the real estate prognosticating? Heck no. Does he know much about the Calgary market? Doesn’t seem like it. However, he can be amusing and it is good to have voices that point out that there are actually risks associated with real estate and that renting is not “throwing your money away”. Talk about a pathetic loser who has to  in order to get the herd going, the man is truly pathetic, I guess being wrong for 5 years will get him scrabbling to whatever  he can muster up to keep the blog going. One thing I noticed is that his  have some type of sexual orientation to it, it doesn’t sound like he’s getting any. Mikey, sorry about the edits, but I’m trying to avoid having Garth threaten to sue me, as he has already done in the past. …lose the detracting adolescent sexual referencing. It isn’t a matter of morality, it’s a matter of if you want your message to be taken to the next level and seriously, you act accordingly. …some of your language makes you seem like a pervert. It’s just that most of your metaphors paint a picture of a prurient old man, not getting any, but hounded by constant desire. Frankly, you sound like an under-sexed teen (with a Hummer, even more telling) and therefore use the lewd language to fill a void. Seems to be a supply problem in part due to the city. Much of the NW from Bowness onwards can’t be developed due to infrastructure bottlekneck. There is room for hundreds of old homes in Bowness to be torn down and replaced, however it may be 2017 before new permits are issued there. Elsewhere inner city land is incredibly expensive and will not be able to support and sub 500$ pricing. In 2007 a house selling for $250K now goes for over $500K. If you listened to Mr Turner 5 years ago and didn’t buy, then you would have missed out on $250,000 in capital, tax free gains / appreciation. Not to mention 5 years worth of rent that went down the toilet, instead of paying down your mortgage.